Our product range includes a wide range of test sieves, direct shear apparatus, automatic soil compactor, swell test apparatus, cbr testing machine and proving rings. We manufacture the Test Sieves which are used to separate wanted elements from unwanted material by making use of a woven screen like a mesh or net like in cooking, especially with flour. 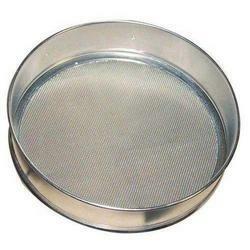 A sifter is utilized to aerate the substance, among other things. The strainer we provide is a type of sieve typically made use of two separate a solid from a liquid. The word sift derives from the word sieve. This range of Sifter Sieves are manufactured out of high quality of frames that assures consistency, fit and function from one end of the sieve to the other and are utilized for various applications such as grading of various type of soil, building materials etc. 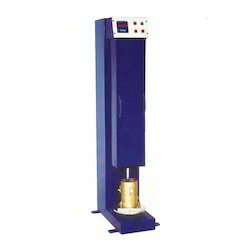 Owing to our expertise in this domain, we are engaged in offering a supreme quality Direct Shear Apparatus. 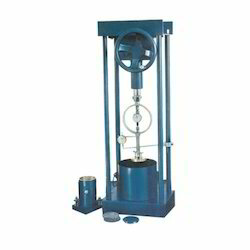 Used by geotechnical engineers to measure the shear strength properties of soil, these apparatus are highly acknowledged by the clients owing to their features like ruggedness. The provided apparatus are available in varied designs and specifications so as to meet clients’ different requirements. Besides, clients can avail these apparatus from us at nominal prices. We offer a vast collection of Automatic Soil Compactor that is used in soil compaction which is a process in which a stress applied to a soil causes densification as air is displaced from the pores between the soil grains. Our Compactors assist in making the soil suitable for road construction. The heavy weight of the soil compactor reorients and compact the soil particles. These compactors are devised by making use of superior quality checked materials that makes possible these products durable and dependable. 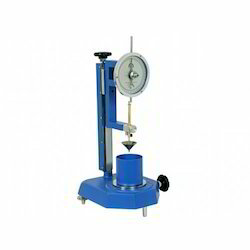 We are reckoned as a foremost manufacturer, trader and supplier of Swell Test Apparatus. The offered apparatus is available with ring attached to the lead screw of hand operated load frame. Used to determine the swelling pressure developed by soil specimens, these apparatus are highly praised by the clients for their different sizes and designs. Clients can avail these apparatus from us at affordable prices. Proving ring of 2.5 KN capacity with calibration chart and carrying case. 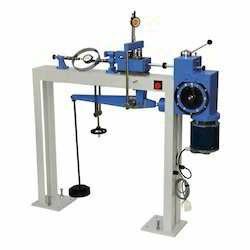 We manufacture and extend a variegated range of California Bearing Ratio (CBR) Testing Machine which is used in testing the relative bearing ratio and expansion features of soil of base, sub base and sub grade for the development of roads, pavements and runways. 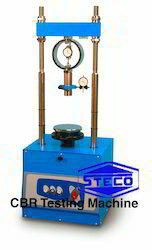 Our CBR Testing Machine can be used for the testing on all types of soils including sand, gravel, crushed stone etc. This kind of test is used widely utilized for selection of materials and control of sub-grades. Moreover, this Laboratory CBR Apparatus includes load frame and motorized bench mounting. Our esteemed customers can avail from us a superior quality range of Proving Rings as per their specific requirements. These Proving Rings are manufactured by employing the most modern technology and advanced machinery, at the state-of-the-art infrastructure. Moreover, we can customise these proving rings as per the exact details provided by the esteemed patrons. 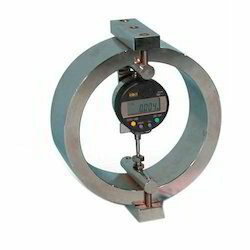 We are one of the renowned names of the industry engaged in offering genuine quality Penetrometer to the customers. These products are designed in compliance with the international quality standards. Moreover, we check these Penetrometers on certain quality norms to gauge their flawless nature, before their dispatch to the clients’ end. 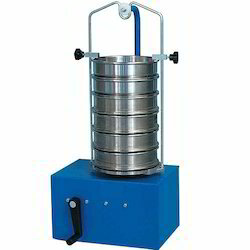 This sieve shaker is designed to carry up to 7 sieves of 6 inch or 8 inch diameter. The 12 inch dia.sieves can be used with the help of Adaptor. A 1/4 HP. motor through a reduction gear immersed in oil drives the shaker. The sieve table dies not rotate but is inclined from the vertical axis and the direction of inclination changes progressively in clockwise direction. If the stop-pin below the table is removed. The shaker can have a rotary motion. In addition to this gyratory motion of the table, there is an upward and downward movement ensuring that each square cm of the sieve is utilized. A pair of rods and a holder is supplied. The holder can be fixed on the top of the upper most sieves, and thus the sieve set is firmly held. Suitable for operation on 230 volts, 50 cycles single phase A.C. Supply. This sieve shaker is designed to carry up to 7 sieves of 18" diameter. The shaker is driven by a 1/2 H.P.Electric Motor through a reduction gear. The sieve table does not rotate but is inclined from the vertical axis and the direction of inclination changes progressively in the clockwise direction, in addition to this gyratory motion of the table, there is an upward and downward movement at a frequency of about 270 vibrations per minutes ensuring that each square inch of the sieve is utilized. The whole gear mechanism runs in an oil bath, without test sieves or time switch. Suitable for operation from 220 Volts 50 cycles A.C. supply.